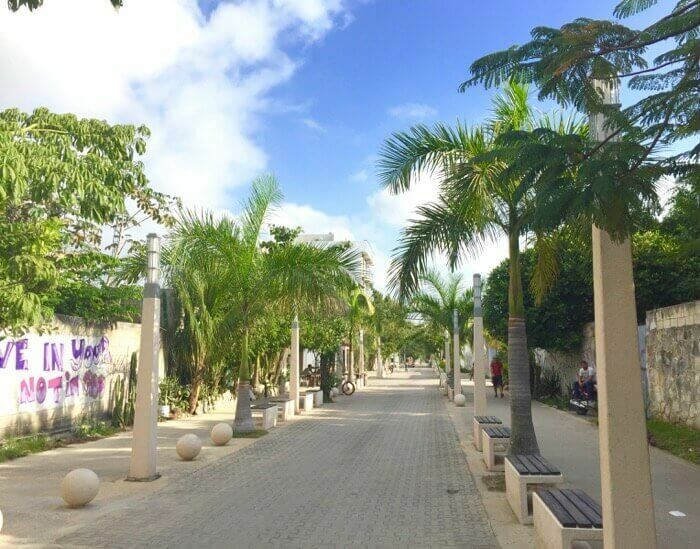 Want to live like a local in Playa del Carmen, Mexico? 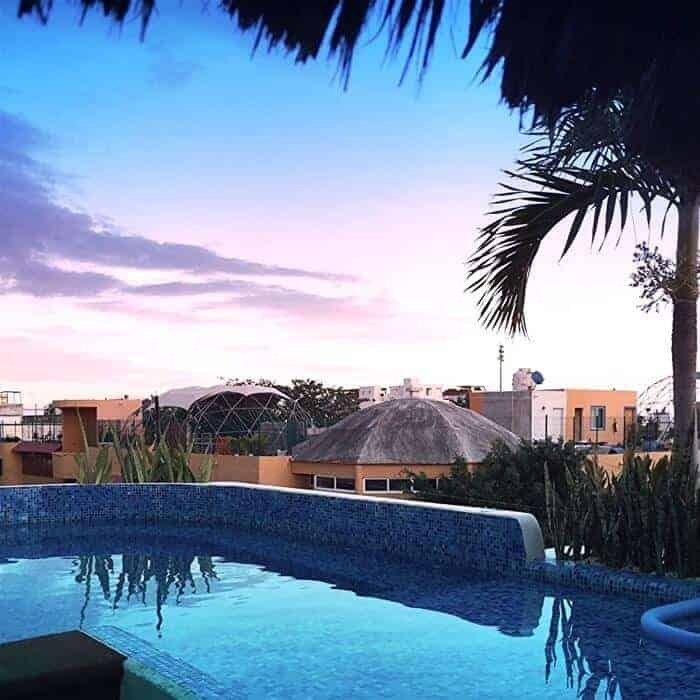 If you’re dreaming of renting an apartment, condo or hotel in Playa del Carmen for a vacation or long term stay, but don’t want to spend a fortune or make a bad choice, read on. 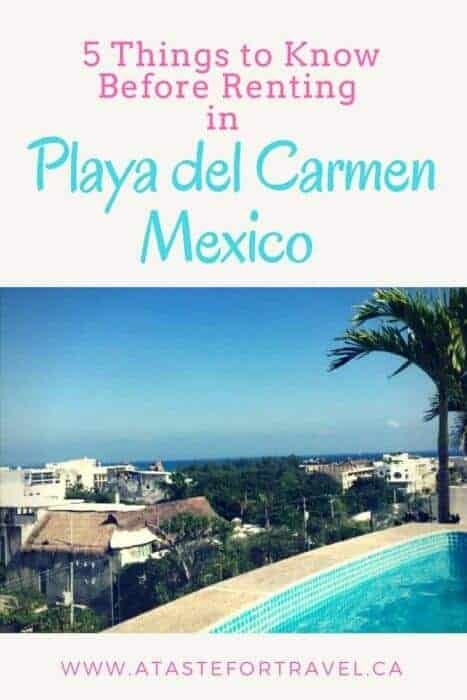 For the past several years, I’ve spent a lot of time on Mexico’s Caribbean Coast and here’s what I’ve learned about Playa del Carmen vacation rentals including how to find a nice apartment, how much to budget and how to make your stay as enjoyable as possible. One of Mexico’s fastest growing cities, Playa del Carmen’s draws include dreamy white, sand beaches, turquoise blue waters and a palm tree-fringed coastline. It’s also a popular jumping off point for visiting Mayan archeological sites such as Chichen Itza and Cobá, colonial cities of Valladolid and Merida as well as the many natural wonders of the Yucatan Peninsula such as cenotes (sinkholes), coral reefs and jungle. It’s also one of the top spots for scuba diving in Mexico . Its combination of affordability (compared to Europe or the US), growing number of co-working spaces and reliable high-speed internet service makes it especially appealing to digital nomads– location-independent people who work remotely. Day-dreaming about becoming a digital nomad? Learn how to earn income while travelling the world with this list of top jobs for digital nomads. For a travel writer like me, Playa del Carmen offers an almost-perfect combination of reliable WiFi, proximity to Cancun International Airport and beachy lifestyle. Although more expensive than other beach destinations in Mexico such as Puerto Escondido or Mazunte on the Pacific, it’s affordable enough that as I can live very comfortably on less than $400 USD per month (plus housing). Playa del Carmen is located 45 minutes southeast of Cancun on the Caribbean Coast of Mexico north of Tulum. It’s easily accessible from Belize, Guatemala, Chiapas and Cancun via ADO bus, colectivo (shared mini-vans) or private shuttle. It’s also close to several luxury all-inclusive resorts and hotels, including some of my favourite upscale resorts in Mexico such as Paradisus Playa del Carmen La Perla, Secrets The Vine Cancun, Dreams Playa Mujeres, Grand Velas Riviera Maya and more. When it comes to budget, the price you’ll pay depends on the season, the length of time you will be renting and the location. 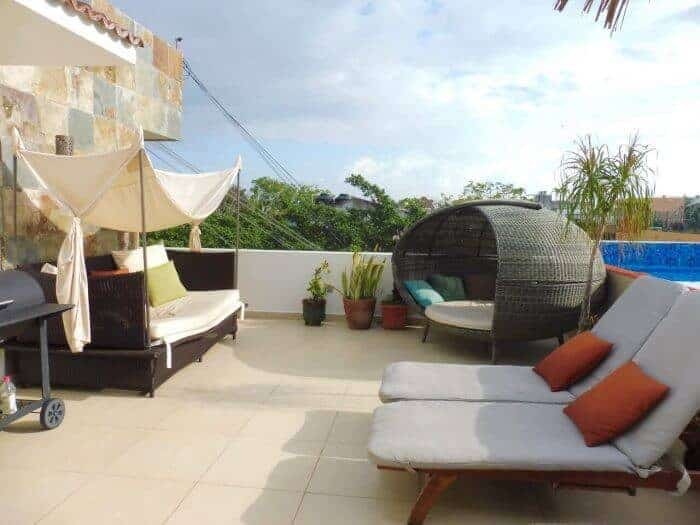 Generally, you’ll pay less for Playa del Carmen vacation rentals if you rent for a longer periods of time, outside of high season (Holiday periods and January-March) and further away from the beach. Your needs may vary, but my wish list for a 3-month stay in Playa del Carmen is usually a one-bedroom or studio self-contained apartment located near 5th Avenue no further north than 46th (CTM), with AC, excellent WIFI, within a 5 minute walk to the beach, proximity to the bike path, major grocery stores, restaurants and bars. It must have a swimming pool, a private balcony or terrace and be located on an upper floor within a low-rise building. Ideally it should be within a safe neighbourhood suitable for a solo female traveller and be relatively new without any history of insect infestations. My budget is between $1,000 and $2,000 a month for a short-term rental. Phew! Sounds like a big wish list doesn’t it? Sound impossible? Not really. Playa del Carmen is experiencing a condominium building boom (just listen to those hammers pounding night and day!) and there are a growing number of apartments available to purchase or rent. And unlike other beach destinations in Mexico such as Puerto Escondido, it’s even possible to find last-minute rental accommodation during peak periods. 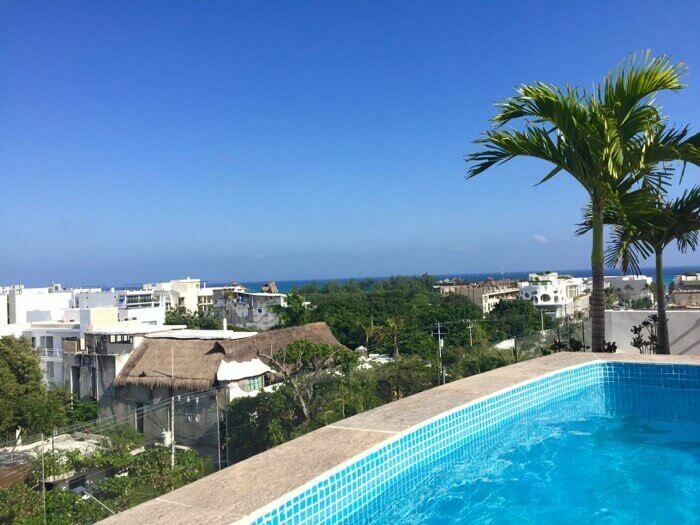 Read on to learn what you can expect for a mid-range apartment rental in Playa del Carmen. 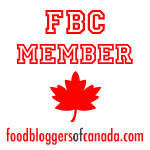 Note that this post contains hotel affiliate links. Check out the disclosure statement for more. Here are a few examples of vacation rentals I’ve stayed in within the mid-range monthly budget of $1,500-$2500 in high season. Suites Coral is located in the Nueva Quinta (or New 5th Avenue) neighbourhood on Calle 46 ( also known as CTM) between 5th and 10th which means you’re an easy walk to restaurants and beautiful Caribbean beaches yet far enough away from the boom-booming of Playa del Carmen’s nightclub scene. I rented my condo from Elizabeth at Renting Playa, who was a fantastic resource both when searching for an apartment and during my stay. Prices quoted range from $50 – $120 USD a night depending on the season. Ask about discount on monthly rates. I have noticed other condos available for rent within the same building such as Pool Paradise listed on Airbnb. Pool Paradise on Airbnb appears to be a street-facing unit while my condo faced south towards the rear of the property. However, the views from the rooftop terrace and swimming pool would be the same. Click here to check prices for Coral Suites Ocean View Rooftop, Mexico on HotelsCombined.com. The location of Suites Coral within the Zazil-ha neighbourhood is quiet (apart from occasional construction noise), it’s just a two minute walk to Playa del Carmen’s beaches, handy for shopping as there’s an OXXO next door, a fruteria a few doors away and several large grocery stores within easy walking distance. Wifi signal was excellent ( reliable, good speed ) which meant I was able to work online without interruption. This studio had great AC, a small balcony to enjoy morning coffee, balcony doors with screens, which is important to me as I don’t want to get mosquito bites. Read my post on 12 Ways to Avoid Dengue, Chikungunya, Zika and other Mosquito-borne Illnesses. My studio apartment at Suites Coral was modern, clean and insect free. I didn’t see any cockroaches, bed bugs or other pests during my stay. There are lots of fantastic restaurants within a few minutes walk of CTM and Quinta Avenida. Check out my post on Best Places to Eat in Playa del Carmen for some recommendations. For me, a negative with Suites Coral was that the kitchen was very small and minimally equipped. The kitchen utensils, pots and supplies were basic and the refrigerator bar-sized which meant there wasn’t much space for storing food. Not a problem for a short-term stay but if you’re planning a long-term stay and like to cook, that could be an issue. Weekly housekeeping was not included with my unit. I paid extra to get housekeeping however the cost was reasonable at 300 MXN pesos for each cleaning. AC is billed as an extra cost according to usage. In my case amounted to less than $15 for the month as I didn’t use the AC very much because the studio enjoys a good breeze from the balcony. 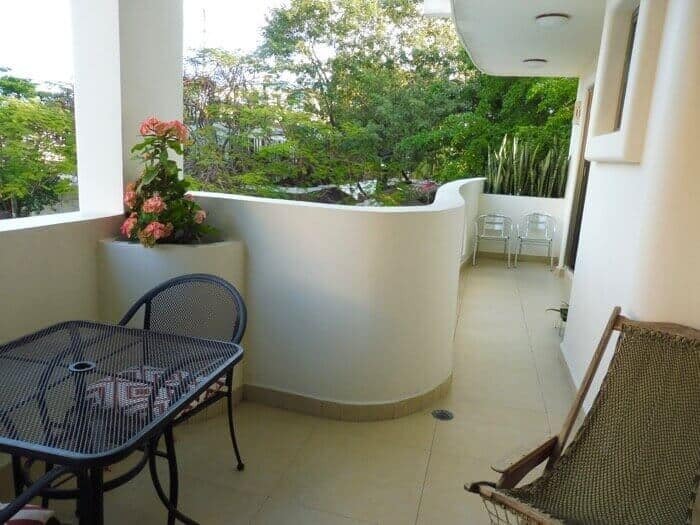 La Dolce Vita is a well-managed, low-rise, 8-unit apartment building in the Colonia Hollywood neighbourhood of Playa del Carmen. We rented a Kingsize one-bedroom Apartment with jacuzzi, large wrap-around terrace on Airbnb and enjoyed a weekly/monthly discount on the rate. A continental breakfast is included in the rate. 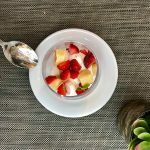 Although we only used it only once– until we were able to pick up groceries– it would be handy for people planning a short-stay. The host was very helpful and arranged an airport taxi pick-up, offered plenty of insider tips on restaurants to eat at and day trips to enjoy. 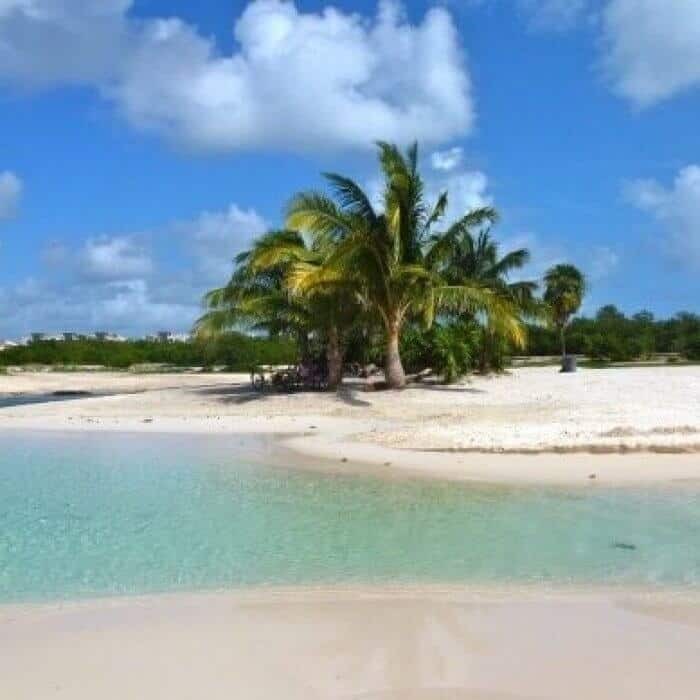 Check out the post on XPU-Ha: One of the Best Undiscovered Beaches on Riviera Maya for one of our favourite day trips. The apartment was spacious and the neighbourhood was safe, convenient and handy to restaurants, beach clubs and beaches. There was a fair bit of construction noise in the neighbourhood but this has definitely diminished since our stay. I recently walked past the building and construction on the apartment across the street is almost complete. The linens were a bit tired looking so I requested newer towels and was happy with the replacements. 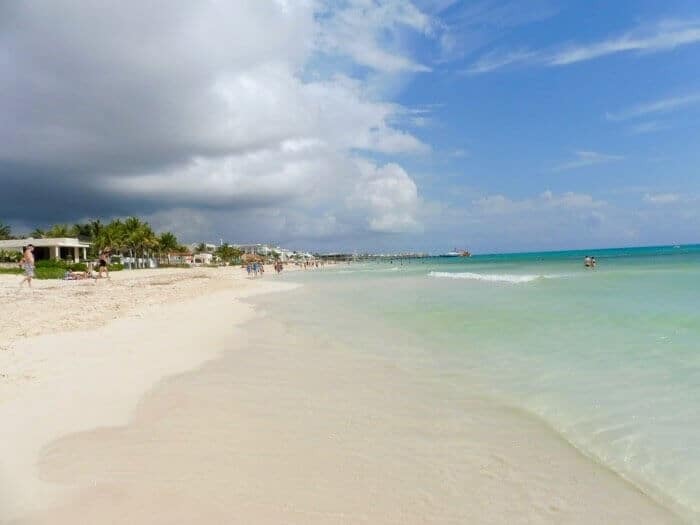 So, whether you’re looking for a budget, mid-range or luxury home away from home next winter, there is plenty to choose from in Playa del Carmen Mexico. Check out the details below for more information, tips and resources to help make your stay on Mexico’s Riviera Maya as enjoyable as possible. How to Get to Playa del Carmen Vacation Rentals: You can take an ADO bus to and from Cancun Airport but if your flight arrives in the evening or if you’re travelling solo and are unsure of where you’re going, it’s handy to book a private shuttle van that will pick you up at the airport and deliver you directly to your apartment rental. 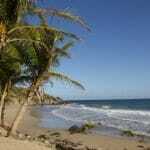 Both Renting Playa and La Dolce Vita offer a shuttle service that costs between $65 and $75. Or, you can use Happy Shuttle, a shuttle van service that offers one-way pickup for $65. The driver was on-time, the vehicle was new (and had AC) and best of all, the driver was experienced with Playa del Carmen and knew where he was going. 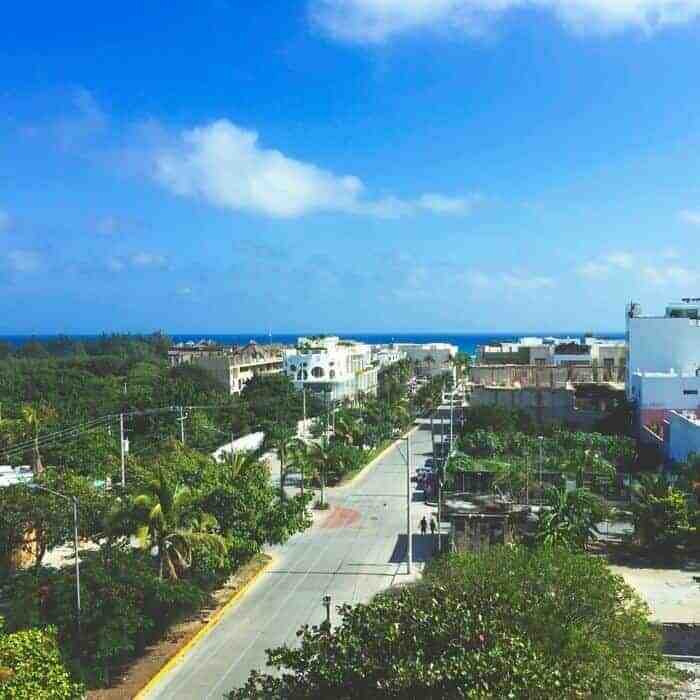 Often, if your driver is from Cancun there’s no guarantee that he or she will be familiar with Playa del Carmen beyond the major hotels. Overall, the booking process and service at Happy Shuttle was excellent. Laundry: It’s quite economical ( around 14 MXN a kilo) to get your laundry washed in Playa del Carmen so it’s not necessary to have a washing machine and dryer in your apartment. I never spent more than 100 pesos($5 USD)for a week’s worth of laundry including bedding and towels. Plus, there’s something wonderful about picking up fresh, clean clothes that are nicely folded rather than spending a sunny day standing by a washing machine. Electricity: The cost of electricity is expensive in Mexico ( it’s the priciest utility in the country) so it’s worth asking if electricity is included in your rental rate especially if you plan to use the AC. If electricity is not included in your monthly rental rate, ask about the cost per kilowatt and be sure to take a photo of the meter when you check-in. Water: It’s especially convenient, much less expensive and more eco-friendly to have a large bottle of water supplied with your rental unit rather than lugging home a container of purified from OXXO every day. Ask if water delivery is included in your short-term rental rate . Official Riviera Maya Tourism Board: Get travel information, handy maps, tips on accommodation and more at the Official Riviera Maya Tourism Board in Quintana Roo. Where to Buy House Supplies: If your condo or apartment isn’t as fully equipped as you would like, it’s worth investing a few dollars at the Tiangus or Sunday Flea Market in Playa del Carmen. This street market takes place on Calle 54 between Avenida 10 and 30 although it also spills out onto surrounding streets and stretches down to Quinta Avenida. Pots, pans, kitchen linens, kitchenware such as cutting boards, garbage bins, food storage containers, clothing and virtually everything else you could dream up is for sale here. It’s also an interesting food destination as you can enjoy BBQ shrimp on a stick, fresh mango smoothies and even chapulines de maize, the gigantic version of the dainty spiced and toasted grasshoppers popular in Oaxaca. The Sunday Flea Market begins around 10:00 am and ends around 3:00 pm. Printworthy list of useful tips! Playa del Carmen looks enticing in your photos, not as crowded as I’d expect. Three months at Suites Coral with even a basic kitchen sounds excellent! 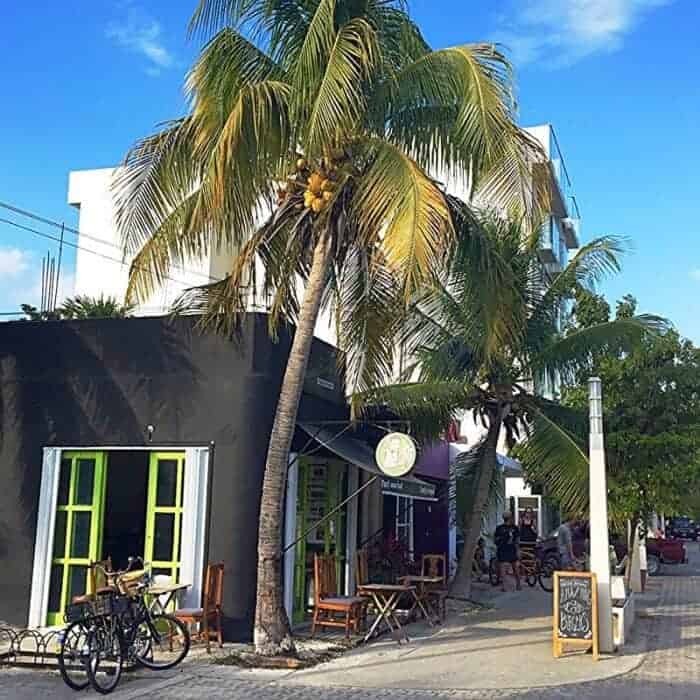 Great tips for renting in Playa del Carmen. The tip on electricity is very useful and I love the idea of picking up freshly laundered clothing! 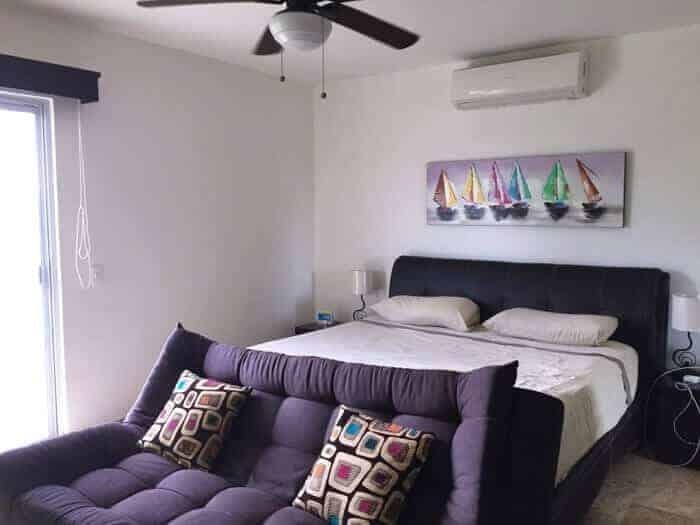 That is a really comprehensive guide on finding an apartment to rent in Playa del Carmen – thank you for all the tips and opinions! It will be of help, I’m sure! This is very helpful! I can see myself moving to Mexico in the future- if not permanently at least for a few months to escape the cold winters in Chicago. I haven’t done much apartment rental, but it’s such a great idea. Might be heading to the Yucatan later this summer and will look into this. The article offers so much great info. Awesome resource. I often rent a villa, it is great for my dogs! I like having a home from home. I adore that whole area of Mexico! Even though I’ve been many times, I always find new things to do, as well as enjoy doing some of my favorites again. 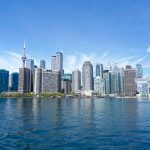 My bucket list includes a 3-month stay, so your post with all the different rentals was very exciting! Great post, Michele. I’m glad you mentioned the construction issue, as I, too, noticed this in Playa, and therefore preferred a more quiet setting in Puerto Morelos. I was very interested to read your article since my husband and I want to be able to perhaps go to a warm location for a month in the winter when he retires. Playa del Carmen sounds like a viable option that I will explore in more detail in another year or so! Thanks for providing such thorough information from your real-life experience. Wow, $200 is really hefty – that must have been a shock!